This one is probably my favorite this year. 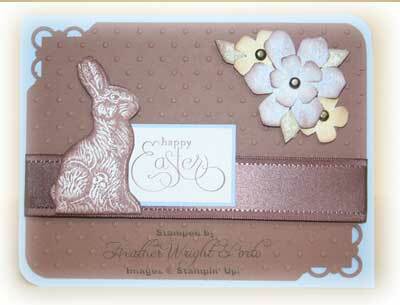 It features the new Chocolate Bunny stamp and the Vintage Vogue stamp set from the Occasions Mini. I really like this color scheme -- Close to Cocoa, Bashful Blue and Barely Banana! Create a standard card from Close to Cocoa and round two corners as shown above. Cut a 4 x 5-1/4 piece of Bashful Blue and round the same two corners. Then use the Scallop Trim Corner punch on the other, remaining two corners. Run the paper through the Big Shot using the Polka Dots Textured Impressions Folder. 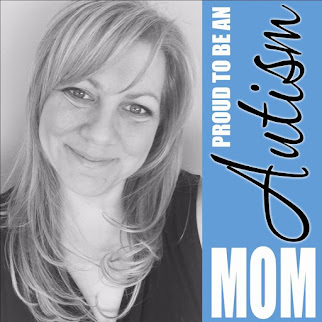 Wrap the wide Chocolate Chip Satin ribbon around the card and adhere to back. Stamp 3 small flowers; one in Bashful Blue and the others in Barely Banana. Cut out and then use a Dauber with Chocolate Chip Classic Ink to sponge the edges. Stamp and cut out one large flower in Bashful Blue and sponge edges the same way. Pierce all flowers in the middle and place Vintage Brads. Adhere to card front using Stampin' Dimensionals, Pop-up Dots, Mini Glue Dots or SNAIL. Stamp and adhere greeting from the Well Scripted stamp set. Mat greeting in the Close to Cocoa paper. Stamp Chocolate Bunny in Chocolate Chip ink on Whisper White paper and cut it out. Sponge the edges a little bit. Adhere to card font using SNAIL adhesive. NOTE: This card is simplistic however takes a little bit of time due to cutting out all the flowers and the bunny. Wishing you and your family and friends a VERY Happy and Beautiful Easter!